Farrar, Straus and Giroux, 9780374271572, 256pp. It's 2022. François is bored. He's a middle-aged lecturer at the New Sorbonne University and an expert on J. K. Huysmans, the famous nineteenth-century Decadent author. But François's own decadence is considerably smaller in scale. He sleeps with his students, eats microwave dinners, rereads Huysmans, queues up YouPorn. Meanwhile, it's election season. And although Francois feels "about as political as a bath towel," things are getting pretty interesting. In an alliance with the Socialists, France's new Islamic party sweeps to power. Islamic law comes into force. Women are veiled, polygamy is encouraged, and François is offered an irresistible academic advancement--on the condition that he convert to Islam. 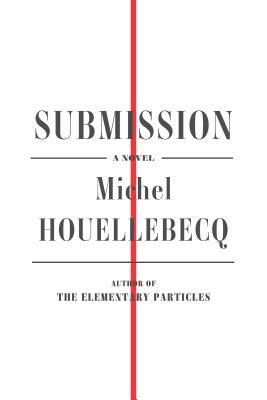 Adam Gopnik in The New Yorker has said of Submission that "Houellebecq is not merely a satirist but--more unusually--a sincere satirist, genuinely saddened by the absurdities of history and the madnesses of mankind." Michel Houellebecq's new book may be satirical and melancholic, but it is also hilarious, a comic masterpiece by one of France's great novelists. Michel Houellebecq is a French novelist, poet, and literary critic. His novels include the international bestseller The Elementary Particles and The Map and the Territory, which won the 2010 Prix Goncourt. He lives in France.